Fatal air accidents almost never happen, fortunately for both passengers and investors in airlines. Yet Malaysia Airlines has been struck twice by tragedy in little over four months. The aviation industry may have its own set of challenges, but it is a reminder that even more robust businesses need to consider political risk carefully. A long-range surface-to-air missile is suspected to have brought down flight MH-17 killing all 298 people on board when it crashed over eastern Ukraine on July 17. Another Malaysia Airlines flight en route to Beijing disappeared in March without a trace. The chances of either were vanishingly small. Fatal accidents per a passenger departure have more than halved in number since 1990, according to the International Air Transport Association. The airline industry is one of the least able to financially absorb shocks. High oil prices and intense competition for market share have already driven several close to the brink. In Asia, high levels of government ownership set the scene for undisciplined expansion. State-controlled and loss-making Malaysia Airlines was already planning to announce a major restructuring within the next year. That may now need to be accelerated. Yet woes of Malaysia Airlines will resonate more widely as geopolitical risk continues to boil. A year ago, the rise of al-Qaeda offshoot, the Islamic State in Iraq and the Levant (ISIL), across Syria and oil rich Iraq was not on the global agenda. Nor were the acts of separatist terrorism seen recently in China. Even in Hong Kong, one of the world’s richest and most modern cities, calls for democratic reform have emerged as a threat to its stability that few would have foreseen. Investors and companies can minimise risk, where they can identify a threat in the first place. Several international carriers say that they had shifted the route taken by flights operating in Ukraine months ago amid increasing tensions between Kiev and pro-Moscow rebels, even though the area was not subject to official restrictions. Malaysia Airlines’ misfortune may be a tragic reminder of the dangers of underestimating the likelihood of the unthinkable. This story has been updated to correct the date of the Beijing-bound flight in the second paragraph. Malaysia Airlines flight MH-17 crashed on July 17 over eastern Ukraine killing all 298 people on board, with officials in Kiev and Moscow both denying involvement in the shooting down of the jet. Ukraine accused pro-Moscow militants, aided by Russian military intelligence officers, of firing a long-range, Soviet-era SA-11 ground-to-air missile. Leaders of the rebel Donetsk People’s Republic denied any involvement and said a Ukrainian air force jet had brought down the intercontinental flight. The International Air Transport Association (IATA) said after the crash that “based on information currently available it is believed that the airspace that the aircraft was traversing was not subject to restrictions”. Australia’s Qantas Airways and South Korea’s two major carriers said after the crash that they had shifted the route taken by flights operating over Ukrainian air space months ago amid increasing tensions between Kiev and pro-Moscow rebels. Shares in Malaysian Airline System (MAS), as the operating company is known, were trading down 13 percent on July 18 at 0130 GMT, having already fallen 10 percent since March 8 following the disappearance of its flight MH370 with 239 people onboard. That flight has still not been found. 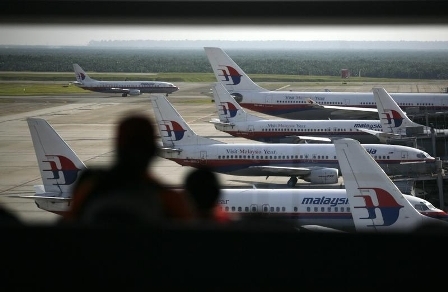 State investor Khazanah, which owns 69 percent of the airline with a market capitalisation of $1 billion, said in June that it planned to unveil a restructuring plan for MAS within one year.